Adventures of Tanglewood: Where Has All My Power Gone? Where Has All My Power Gone? Anyone who anchors out a lot like we do, and doesn't run a generator all the time, really cares about power consumption. The less power you consume, the longer your batteries last, the more effective solar power becomes, and the less you need to run your generator. And every bit of power you consume turns into heat which, depending on your climate, makes the boat harder to cool. On the other hand, I don't want to be camping when we are on the boat. We want all the comforts and conveniences of home. The goal is to have your cake and eat it too, and that means being mindful of power consumption, and making sure every watt consumed is serving you well. This is front and center in our minds since we are now on day 55 without plugging into shore power. Since leaving La Paz at the end of February, we haven't plugged in once. We have spend a couple of weeks at the marina in Puerto Escondido, but the power is under construction and we have not had any for our whole stay. It's along time without shore power, but everything is working just fine, and we honestly don't miss it. We recharge, do laundry, and make water while underway, or we run the generator if we are not underway. During the day most of our power needs are covered by our solar panels. This is all possible because we have paid close attention to appliance selection and electrical system design to minimize wasted power, while at the same time not giving up any of the conveniences that we want. With a little attention, we have our typical battery draw down to around 20A on average, when other boats of the same model are more typically in the 30-40A range. One thing that has been really interesting over the past couple of years, and the subject of this article, is looking at where all our power goes. Some of it you might expect, but I'll bet there are some surprises as well. Below is a table in rank order of the primary power consumers while we are at anchor going about our daily business. It is essentially the daily background load, but does not include any form of cooking, laundry, or any number of other things. So it's not an exhaustive study - just a snapshot of a bunch of things that are on pretty much all the time. I think if you ask most boaters what the biggest power consumer is on their boat, they would say it's refrigeration. And they would probably be right, unless they have a KVH sat device. Our KVH V3ip Sat phone and data system consumes 140W continuously which is three and a half times more daily power than the fridge which is the next high runner. Wow, what a pig. After discovering this, I turn it off at night to save power. The fridge consumes a bunch of power, but considering it's a full size fridge and freezer, it's actually not bad at all and comparable to any other quality marine fridge. The next big one is the boat's network switch. We have a 24 port gigabit ethernet switch, and because it's on all the time, it's power draw really adds up. I have been working on putting the commonly used things on a smaller, lower power switch, and only using the big switch when specifically needed. Turning it off would be almost like turning off the fridge from a power draw perspective. Next is the dishwasher. We typically run it once a day, and the chart shows the power consumption for a full wash cycle. It's a lot, but we clearly get something in return. Our N2K network adds up over 24hrs as well. It would be nice to get it down lower, but we use most of it for tank monitoring, weather, anchor watch, and alarming, so there isn't much we are willing to give up. The water pump is a lot, and I think it's higher than it needs to be because of the way our Headhunter Mach 5 pump works. Most pumps cycle on when pressure drops below some level, run until pressure builds back up, then shut off. The Headhunter does the same, but it keeps running as long as there continues to be water flow. So, for example, it will run the whole time you are taking a shower. It has the benefit of maintaining constant high pressure the whole time rather than pressure that cycles up and down, but I'd estimate that it runs twice as long as a conventional pump doing the same thing. - A lot of entertainment electronics, especially older models, don't really turn off when you turn them off. They may go dark, but many keep drawing the same or nearly the same amount of power as when turned on. Cable and satellite TV boxes are particularly offensive in this regard, and can often be one of if not the largest power consumer in your house or boat. - TVs have improved significantly in the past 5 years with respect to power consumption. First, to get an Energy Star rating, they have to actually stop consuming power when you turn them off, or at least drop down to a very low level. If you look at the EPA ratings, it will tell you what the standby power draw is. It should be less than a watt. And LED TVs are much lower power than older LCD TVs. So if you are looking an excuse to get a new TV, this might help. - Some things may not be as bad as you imagine. Take a microwave oven. Yes, they draw a lot of power when on, but you typically only run them for a short time. If you run a 1000W microwave fro 5 minutes a day, that's only 83 watt-hrs per day, and would rank near the bottom of the list above. - Refrigeration can be bad, or not so bad at all. A lot of people dump on sub-zero for being a power hog, but our particular model really isn't that bad, and is actually comparable with the most efficient alternatives of a similar size. On the other hand, I helped a friend who was having battery trouble on his boat, and his fridge was consuming eight times as much power as ours. 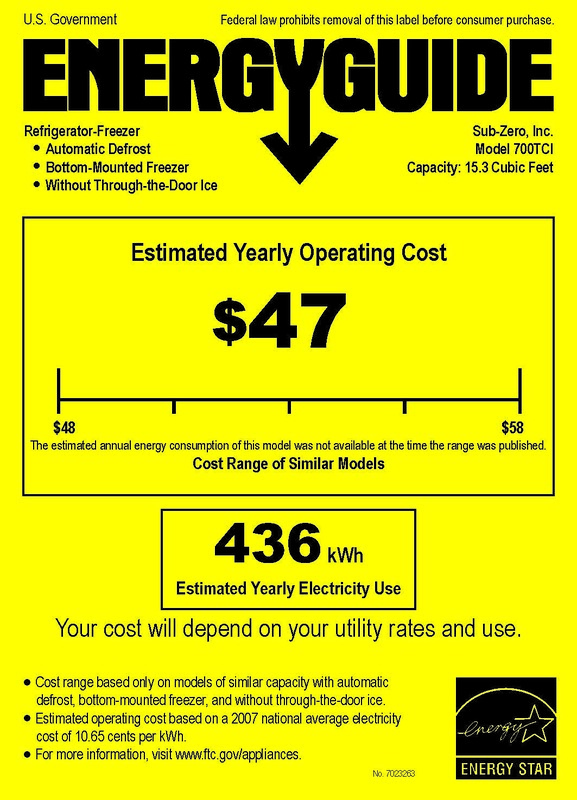 In his case, I'm quite sure there was a problem with his fridge, but just looking at the EPA ratings you will quickly see that there can be significant variation in the performance of similar sized units, both for fridges and freezers. - LED lighting makes a huge difference. Most 12V and 24V bulbs can be swapped for LEDs, and LED bulbs for 120VAC fixtures are readily available too. Our lighting power load is so low that I simply pay no attention to it at all anymore. - As a corollary to LEDs, florescent lights do use a lot of power. Our engine room lights draw several hundred watts, and if left on are worse than the KVH. They are excellent candidates for replacement with LEDs. If you are interested in digging into your own boat (or home) to see where the power goes, there are a few tools that will help. 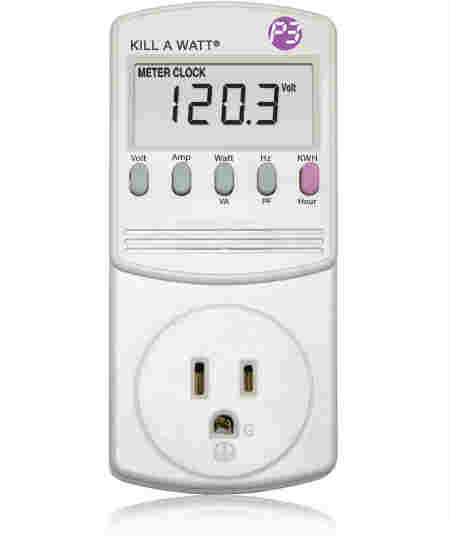 First is a Kill-O-Watt meter which simply inserts between any plug-in appliance. 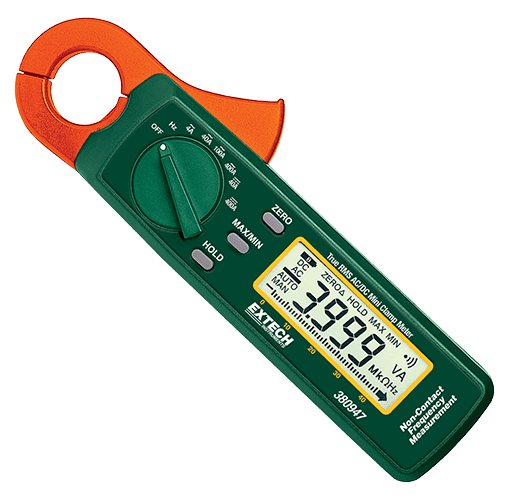 It shows instantaneous power figures, and also totals up the power consumption over time which is particularly handy for things that cycle on and off like a fridge or water pump. The next is a clamp-on ammeter. These are commonly available for AC power, but less common for DC power. If you want to measure the power for any DC device, you will need one that can measure DC current. And for major appliances, I have found the EPA EnergyStar guides to be quite accurate. 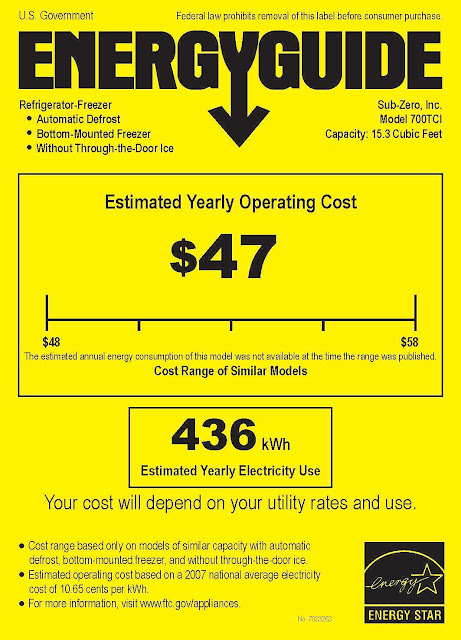 They have accurately predicted the power consumption for several refrigerators and freezers that we have had over the years, and at a minimum provide a good comparative guide. Just a note of deep gratitude for your insightful, knowledgeable, and thoughtful posts. Thank you. You might want to look at Ubiquiti's switching products. They're fast but power efficient and some have DC input power options. Great info here, Peter. It's surprising how some of the higher loads come from unexpected sources. I like the Kill-A-Watt suggestion for AC loads. I also glean lots of info from my digital ammeter in my battery state of charge monitor. Switching steady run appliances like fans, radio, TV or lights on/off allows me to monitor individual loads as the total ammeter load changes. Thanks for summarizing your findings so meticulously. It provides a great reference for anyone with interests in vessel electrical loads. Good day Peter and thank you for another informative post. A few questions for when you may have time. What is the impact of A/C use (recognizing of course that you are minimzing it to the greatest degree possible)? Or maybe I should say "impacts". Current draw at startup, running consumption, your thoughts on energy equivalence for the genset fuel, that sort of thing. And how does the electrical system (genset, battery bank, inverters, etc.) cope when the bigger loads come on in succession and concurrently? In other words, is the overall system "smart enough" to continue to supply balanced voltage/current or are there slowdowns or other results? Larry, I only have pieces of the puzzle, not the whole thing. Maybe someday, but not yet. On the HVAC, I won't say we minimize it at all. We want the luxuries that are part of a Nordhavn, and aren't afraid to use them. We just want to get the most out of the power that do use. I haven't made any detailed measurement of the HVAC power consumption other than observing the ammeter that is part of the power panel. All the various HVAC components appear to use exactly what their spec sheets say they will use, so that's good. Under most circumstances, we can run the boat with HVAC on a single 50A 240V dock plug. There is a second plug that can be dedicated to the HVAC, but other than to test it, I have never needed to use it. But coincidentally, I just tripped the shore pedestal breaker. We just spent the past 2 hrs at the fuel dock (ouch), engines off, but ER fans and other house loads on. When we got back to our slip, the boat was hot, the batteries were down a bit, and the hot water had cooled off a bit. So when I plugged back in, all the HVAC units came on, the HW heater came on, and the inverters went into charge mode. Pop went the breaker. So I shut off the HW heater and the PH HVAC, let the rest of the boat cool down and let the batteries top up. Then after about 30 minutes I turned the PH HVAC and hot water heater back on, and everything is running fine. Normally when you coem into dock, your batteries are fully charged and the HW is super hot from the main engine, so neither of those things run for quite a while. We just hit a bit of a freak coincidence of events. Getting back to inverters, they have had no trouble handing peak and transient loads, but I should also point out that the HVAC is NOT on the inverters. The Outback inverters are quite good at transient loads, so no trouble there at all. And if I want HVAC while underway, I just run the generator. Between the HVAC and other house loads, it handles it well, and I'm pretty sure burns less fuel than generating the same power via the engine alternators. Because of their lower voltage, and subsequent higher current, the alternators are a good bit less efficient in their higher load range than the same power from the generator produced at a higher voltage. Thank you for that Peter. As you know I am working on my "land yacht" - fives cabins and a "lodge" (really just a cookhouse for meals, a living and activities space, etc.). Given that the property is almost two miles off any grid it might as well be the Marquesas in our boat parlance. And with electrical systems being my greatest knowledge weakness I have been trying to scope my problem prior to entrusting it to people who will be spending my money. Much like any boat, my "boat" will only be occupied some number of man (person) days per year. My sense is that there is a crossover at some point between diesel, as practiced in the N boats, and solar/propane/other. At the moment I lean toward a setup very much like the boats hence my picayune questions. Have you decided yet on which generators of what size will go in the 68? I think I read also that you will prefer lithium this time for the battery banks. Any brand choices made there yet? Will they be LiFeP04 or other chemistry. You may have read that I was in the middle of deciding the two versus one genset. I lean heavily to two but find that one 62KW makes the most economic sense. And, of the quotes I've gotten that one is powered by the JD4045! About $40K per pop. Any bigger and the prices go steeply upward. Smaller doesn't equally reverse the slope. And does it matter in these cases, both of our boats, whether the gensets are single or three phase? You're right about the Outbacks. Everywhere I look their reputation is stellar. I'm still talking to MidNite and Citel about surge suppressors, both MOV and gas discharge tubes. No decision there yet. I thought about you though. I wonder if putting GDT's as close as possible to user items wouldn't be a good last line of defense? Just thinking. No answers back yet from L3 and Insight as to why there is no lightning detection for boats ala aircraft. One last thing. Although it is currently not being targeted toward marine use Furuno is rolling out a miniaturized doppler weather radar (WR-2100) in a 3x3 dome that looks promising to me given that boat radars are not optimized for weather. No idea what it costs. Sorry for the length. I'm standing on your shoulders in my junior double E efforts and thank you for your time and thoughts. Further to my already too long entry, I had noticed that you, wisely in my opinion, were able to spec a non-electronic wing engine on the N60. On my "boat" I am being required to go to Tier IV because it is a fixed installation. Was wondering what the regulations may be forcing you into this time around? We have an off-grid house which is really the same as a boat that has run well-aground. He have significantly favored solar over generator, and I would do the same again. It's not practical to do the same on a boat because there is never (almost) enough space for sufficient solar. So on a boat, primary power is via engine generation with solar as a supplement, on land primary power can be from solar with motor generation as a supplement. Our house is in a northern latitude and typically the generator only runs in November and December, with annual generator run time of 100 hrs or less. And our generator is only 14kw. Now keep in mind that we do not have HVAC, and if you did, that would likely change things. But I would still install solar as the primary power source. The EPA regs have rolled out to diesel engines in stages based on application and based on liters/cylinder of engine size. So one answer does not fit all. When our 60 was built, the main had to be Tier II, but not the wing, so the wing is an old-school all mechanical injection engine. With the 68, both the main and wing will be Tier III. There are failure modes in all engines, and that's why we have two of them. I'm simply not concerned at all about the Tier III ratings or any of the technology that goes into it. It's all so well proven over years and years in other applications that I just don't worry about it. I have owned five high pressure common rail electronic diesels, two of them marine engines, and all have been 100% trouble free. Unfortunately my "marina" has six "boats" located in the state of Georgia. With as many as 20 people in attendance in high Summer. Solar will have a place someday but not to start. Looking forward to more great posts Peter and thank you as always.